Geography/Culture: Tibet and India: Buddhist and Hindu Tantrism. Description: Fairy-like Divine Mother of death and rebirth; Tutelary Goddess of individuals; She Who, through sexual initiation, imparts wisdom and occult powers; She Who drives away "evil spirits" [anger, boredom, depression]; Angel of Death; She Who takes the last breath of an enlightened one with Her kiss of peace; She Who is the recollection of the body on the sixth day of the soul's journey after death. In multiple form She is conceived negatively, see below. To Whom are sacred: dancing; the mudra of fascination (made with the right hand: the second finger touches the thumb, index and little fingers raised, third finger folded to the palm); necklace of skulls; skull cup filled with blood; ritual flaying-knife; the colours and directions red -- symbolic of the centre and the west, white -- symbolic of the east, yellow -- symbolic of the south, and green -- symbolic of the north (these are the colours of the Dakinis themselves -- and the directions they come from on the seventh day after death); vajra (spiritual weapon). Perhaps the title of Tantric priestesses who attended the dying, laid out bodies and performed funeral rites. Icon: she is sometimes portrayed as lion-headed. 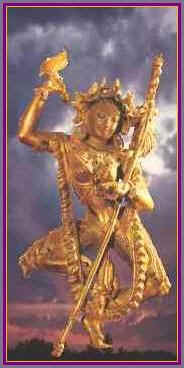 In Tantric art Kundalini, qv, is sometimes portrayed as the Red Dakini. In Tibet She in known as Mkhah-Hgro-Ma, `Sky-Goer'. Vajravarahi, qv, is a Buddhist Dakini. Sources: Couchoud AMDDEM 167; Evans-Wentz TBD 122, 127-8; Rawson TICE 27, 102, pl 64; Stutley HDH 66, 73, 332; Walker WEMS 206. Geography/Culture: India: Hindu Tantrism and folklore. Description: Demonic and malignant spirits; Blood sippers and Eaters of raw-flesh; Bewitchers of men and women. Putana, is a Hindu Dakini, below. Perhaps originally Yaksinis, qv Yaksini, qv Gramadevata. Sources: Ions IM 95; Stutley 66, 345-346. Description: Night-fiend; vampire-like Demoness; She Who poisons children by suckling them on Her poisoned milk. Male associate: Krsna, `[Ploughman]'. She tried to poison him, but he sucked Her to death. See also Yasoda, qv Radha. Source: Stutley HDH 241, 281, 347.
worked on: August 1995; August 1991; June 1990.